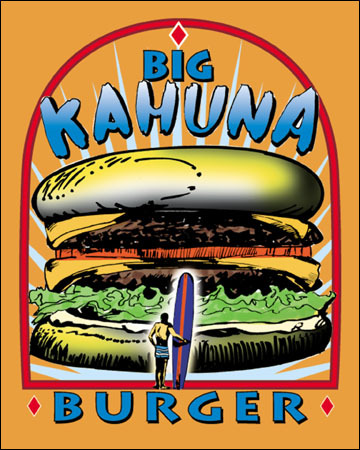 Fictional Hawaiian themed burger chain created by Quentin Tarantino, and featured in Reservoir Dogs, Pulp Fiction and Robert Rodriguez's From Dusk Till Dawn. It is also mentioned as being a sponsor for Jungle Julia's billboards in the Death Proof segment of Grindhouse, featured in Robert Rodriguez's Sharkboy and Lavagirl in 3-D, Quentin's segment of Four Rooms and a scene in Romy and Michele's High School Reunion in which the two principal characters are eating junk food. Southern California and Southern Texas.